The name “Jensen” is likely familiar to many in the pro audio industry as a hallmark of technical excellence, particularly with respect to transformers. And that will live on, especially in light of Jensen Transformers recently becoming a member of the growing group of companies in the Radial Engineering stable. But the story of how that name came to prominence is assuredly not well known, and it’s a fascinating account. Born in 1942, Deane Jensen grew up in Princeton, NJ. 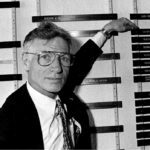 His Norwegian father, Dr. Arthur S. Jensen, was a physicist who earned his Ph.D. at the University of Pennsylvania, and he became an electronic-imaging expert who was awarded 25 patents, taught physics at the U.S. Naval Academy, and later worked for RCA Labs and the Westinghouse Defense and Electronics Center. In this heady atmosphere, Deane recalled Albert Einstein coming to their home to visit his father. 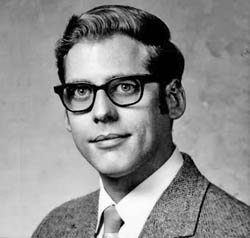 Deane Jensen in the late 1960s. Deane followed the path to the University of Pennsylvania, majoring in physics as well as electrical engineering. He served as chief studio engineer for WXPN-FM, the school’s student-operated FM station, and after college, worked for several broadcasters in Baltimore and Washington DC as well as a recording studio in Camden, NJ before heading to California. By the mid-1960s, recording had advanced from just capturing a live performance to using studio processes that could not be replicated in live performances. The Beatles “Sgt. Pepper’s Lonely Hearts Club Band” album, released in 1967, was a prime example. During this period and into the early 1970s, the recording industry became highly competitive, driving improvement in technology. 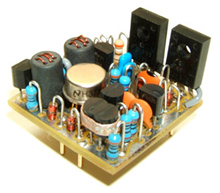 The finest equipment used discrete transistor amplifiers, often in the form of potted modules. Although the first analog operational amplifier integrated circuit (IC) was introduced in 1963, their use was limited until inexpensive and easy-to-use ICs were introduced in 1968. But they didn’t “sound good” and years would pass before “op-amp” ICs worthy of pro audio applications were available. Likewise, most low-level audio transformers of the period were just adaptations of designs intended for industrial or communications use. Against this backdrop, Deane moved to Hollywood in 1966, working as a systems engineer for Studio Electronics Corp. (later UREI), creators of the famous LA-2A and LA-3A limiters. 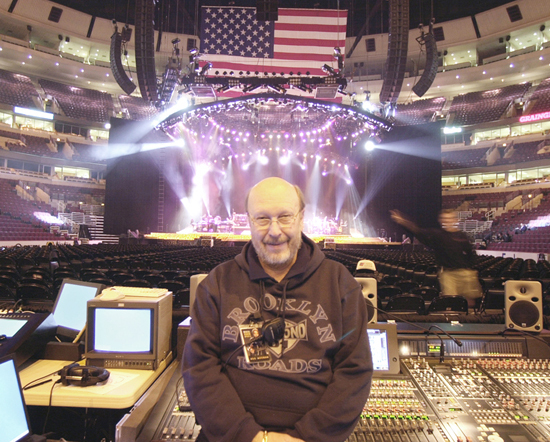 He moved on to positions that furthered his technical and artistic understanding: engineering manager for Sicodim, a manufacturer of high-power lighting controls; systems engineer for Bushnell Electronics, which created custom consoles and complete studios; systems engineer and then VP of engineering for Quad Eight Sound. 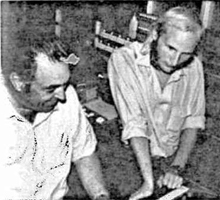 Wally Heider (left) with engineer/producer Chris Huston on a remote recording. In 1969, Deane supervised the installation of a new Quad Eight console in studio A at Wally Heider Recording Studios, for whom he was also consulting. By 1971, he interviewed Bill Whitlock, who he recommended to replace him as he left Quad Eight. This accumulated experience in the recording industry told Deane that audio transformers often were the root cause of “bad sounding” mixing boards and audio systems. He decided to embark on a quest to fix the shortcomings, starting with transformers. Initially, his development lab and office was his apartment in Hollywood. Ed Reichenbach, who supplied transformers to Quad Eight, had been building made-to-order transformers since the 1940s for Altec, Langevin, Electrodyne, and others, and Deane used these designs as his starting point. He became obsessed with how audio transformers interacted with system electronics, and began research to solve the “bad sounding” problems. A 990 op-amp in “DIY” version. In the meantime, he’d also started optimizing audio operational amplifier designs while at Quad Eight, and after leaving, continued to work on an improved design that he eventually called the 990. He completed the design in July of 1979, and his paper describing it was published in the AES Journal later that year. In 1981, he was awarded a patent for the inductive emitter degeneration feature of the 990. The amplifier set new standards for its combination of low noise, low distortion, slew rate, stability, and high output drive capabilities. When Deane published the circuit, he intentionally made the patent public domain, an indication of his dedication to furthering the state of the art. Deane was also a pioneer in computer-aided design. He quickly realized that his work with transformers needed powerful tools to make quick work of circuit analysis and optimization, so he decided to create his own circuit analysis program to run on his Hewlett-Packard programmable calculators (predecessors of today’s computers). 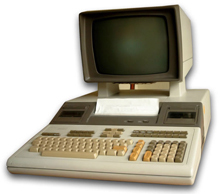 The HP 9845A computer used to write COMTRAN. The final version of this powerful AC circuit analysis program, called COMTRAN, allowed him to accurately model and fine tune the transformer designs — optimizing them for use with “real world” electronics. Hewlett-Packard was so impressed with COMTRAN that it became the first third-party software HP ever distributed, and it was ultimately used by hundreds of engineers to optimize their transformer, filter, and amplifier designs. With the help of COMTRAN, Deane systematically re-designed his transformers to have the response of a Bessel low-pass filter, which by definition has virtually no phase distortion, ringing, or waveform overshoot. He had a level of expertise that rarely existed at competing companies — where audio transformers were just a sideline to other commodity transformers. Deane officially founded Jensen Transformers in 1974 — the first models to carry the Jensen name were “custom” ones, in that they were developed direct from customer requests. This was followed by the JE-series of audio transformers, which quickly became a benchmark of the audio industry. 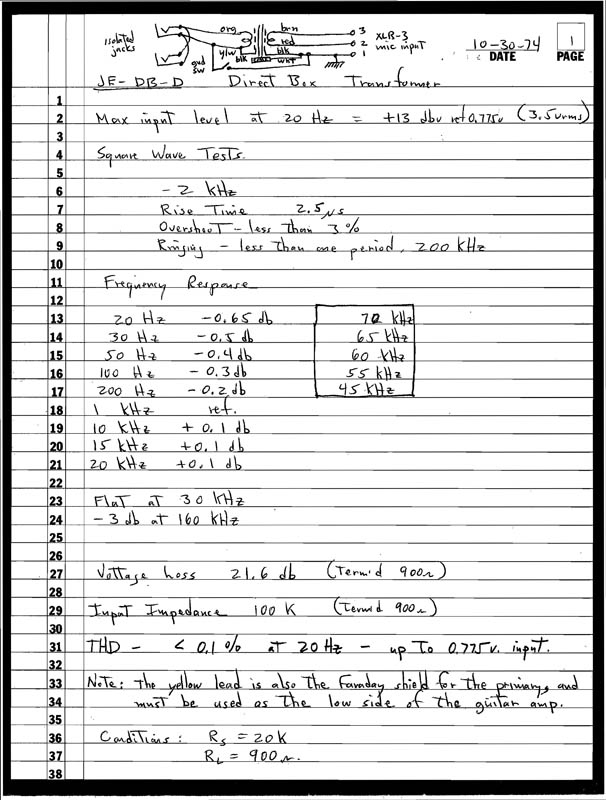 The handwritten sheet of paper on which Deane wrote down the specs and measurements for the first version of the Jensen direct box transformer, the model JE-DB-D. Handwritten sheets like this were the beginnings of what would eventually become Jensen’s formal printed data sheets. Of particular note is the original Jensen direct box transformer, the model JE-DB-D, which Deane developed after meeting an electrical engineer named John “Jack” Crymes while with Wally Heider. Jack was a pioneer in professional remote audio recording who designed and built the world’s first mobile audio recording truck for Heider in 1974. Jack discussed with Deane the need to not only convert guitar level signals down to mic level, but to also completely isolate the guitar amp from the recording console. This lead to Deane creating a dual Faraday shield design, where both the primary and secondary windings had their own internal copper foil “Faraday” shields. Another innovation was special acceptance tests for core materials (still a Jensen trade secret). Until 1979, when he hired office assistant Bruce Black plus software specialists Rob Robinett and Jerry Jensen (no relation) to continue the COMTRAN work, Jensen was essentially a one-man business. By 1980, demand for Deane’s transformers required a move to larger offices on Burbank Boulevard in North Hollywood, and the staff grew to include a bookkeeper and a facility manager, Dave Hill, who today continues to manage operations. Deane was well known for answering simple application questions with dissertations that often lasted an hour. The famous Jensen 3-ring binder catalog, now a collector’s item, contained the most technically complete data sheets in the industry. 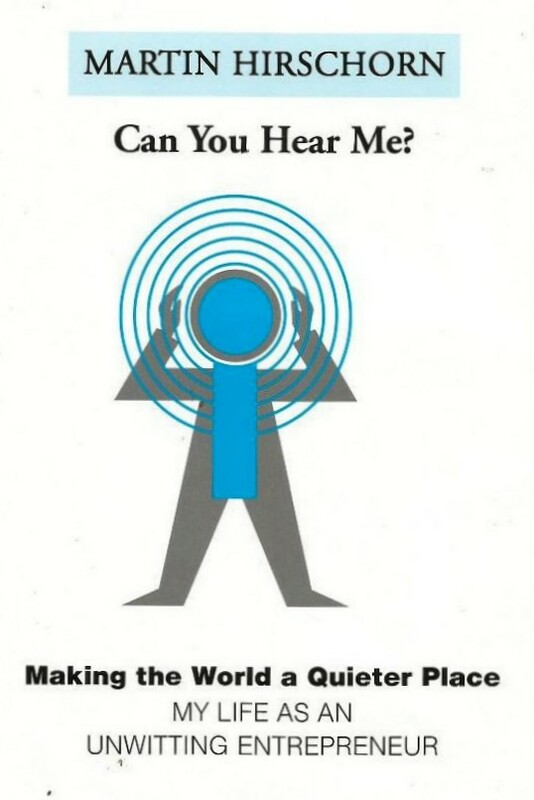 Deane’s many papers and lectures on high-frequency phase response and its audible effects have helped many engineers improve their products. As a contributor to the <i>AES Journal</i>, he became well known for his efforts to improve the fidelity of sound in the recording, sound reinforcement, and broadcast industries. 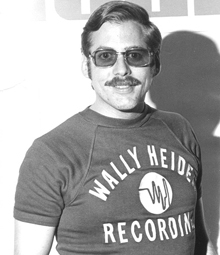 Deane sporting a Heider Recording t-shirt in the mid-1970s. By 1988, tens of thousands of Jensen transformers were in service. Their performance also led to use in diverse applications such as seismic sensing, lab instrumentation, test equipment (including the Audio Precision System 1), and even aboard the space shuttle. In 1983, Deane suffered a debilitating bicycle accident that forced him to use a wheelchair for several years, and he resided in personal living quarters on the Burbank Boulevard property. Further, production quality problems began to increase under new management after Ed Reichenbach passed away in November 1985. Still, despite these and other setbacks, Deane continued to persevere. Several years earlier, Bill Whitlock had departed for Capitol Records, and when he decided to leave Capitol in 1988, he was asked by Steve Desper to engineer a stereo spatial enhancement system called the Spatializer. At the same time, Deane also asked Bill to work with him on some consulting work, and for nearly two years, they re-kindled their friendship and worked on a variety of challenging projects as Jensen-Whitlock Engineering at an office in Bill’s home. Unfortunately, Deane took his own life in 1989. He stated in both his suicide note and his will that he wanted Bill to take over Jensen Transformers. Despite several years of turmoil due to company debt and lawsuits, Bill carried on, saving the company and carrying on Deane’s legacy. A local contract manufacturer was selected, and transformer production was relocated and brought back on-line following his precise designs. To ensure quality control, Jensen also purchased its first Meteor Swiss-made computer-controlled winding machine. In 1990, Deane was posthumously inducted into the TEC Awards Hall of Fame, along with Quincy Jones and George Massenburg, in recognition of his vital contributions to professional audio. Fortuitously, the Spatializer project provided much-needed cash flow to keep the doors open at Jensen during those “down” years. Bill also designed the Spatializer Pro and helped Matsushita engineers develop a Spatializer IC for consumer gear. The Spatializer Pro was a joystick-controlled multi-channel spatial image enhancement device. The design included the first commercial use of the patent-pending InGenius balanced inputs and novel active decoupling in its power supply. Spatializer Pro has been used to enhance hundreds of television broadcasts, motion pictures and compact discs by such recording artists as Michael Jackson (the “HIStory” album), Quincy Jones, Barbra Streisand, Bonnie Raitt and The Eagles. Bill also led the transition from the JE transformer design to JT design, which improved longevity — so much so that it’s backed by a 20-year warranty. In addition, he revised the format of Jensen data sheets and added several in-depth application notes, along with nearly a hundred application schematics to the catalog. From the beginning, it had bothered Bill that he couldn’t explain precisely why a transformer solved real-world system noise problems so much better than the “active-balanced” differential amplifier input circuits that had largely replaced input transformers in audio equipment. 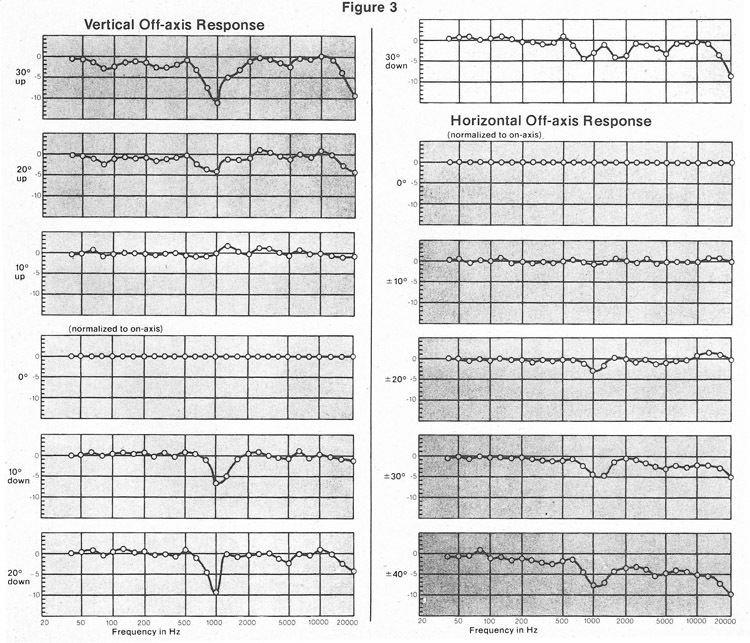 After exhaustive sessions of circuit simulation and analysis, and conversations with colleague Neil Muncy, the “a-ha moment” came and he shared his findings in a 1994 AES paper. What he found also ignited his interest in debunking the myths about balanced interfaces that were so rampant in the audio industry. The result is his landmark 1994 AES paper “Balanced Lines in Audio: Fact, Fiction, and Transformers,” published along with one by Neil Muncy in the AES Journal issue of June 1995. According to the AES, it has become the best-selling issue ever printed. 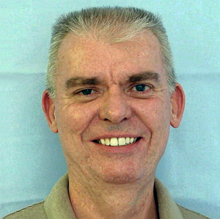 Bill has been an AES member since 1966 and active in standards work, being chairman of the AES Standards Committee working group that produced the AES48 standard on interconnections and grounding. 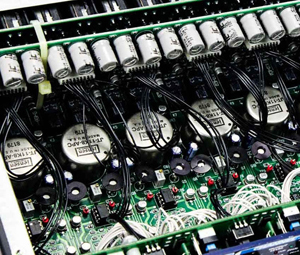 A row of Jensen transformers inside a PreSonus M80 preamp. In 1994, responding to several customer requests, Bill decided to offer Jensen’s transformers in “plug-and-play” packages under the ISO-MAX brand. The first offering, model CI-2RR, was a 2-channel box with RCA connectors aimed at consumer interfaces. Its popularity grew rapidly in the emerging home theater installation market, giving installers a no-compromise, safe solution for ground-loop issues that had been routinely dealt with by illegal and dangerous “ground lifting” at equipment power cords. Jensen expanded the line to include isolators for balanced audio, video, and cable TV as well as special-purpose interface boxes of all kinds. By 2012, the company decided to bring all manufacturing in-house in order to better control quality. More Meteor winders were purchased, bringing the total to five. The transition took longer than anticipated, slowing delivery schedules. One of the most affected customers was Radial Engineering, maker of the game-changing JDI direct box (among dozens of innovative products). In fact, the company’s relationship with Jensen stretches all the way back to 1992 when Radial served as Jensen’s Canadian distributor. With Bill contemplating retirement and pondering the company’s future, Radial owner Peter Janis expressed an interest in buying Jensen, and an agreement was signed in April 2014. Subsequently, the company has already invested in two more Meteor winders, increased raw goods inventory, and hired more assembly workers to meet delivery demands. The company will remain at its current home base in Chatsworth, CA, and Bill is staying onboard as technology manager. And that’s how a name can become ubiquitous in an industry, and further, how’s it’s legacy will continue live on. Editor’s note: Our grateful thanks to Bill Whitlock for his work in the composition of this article.